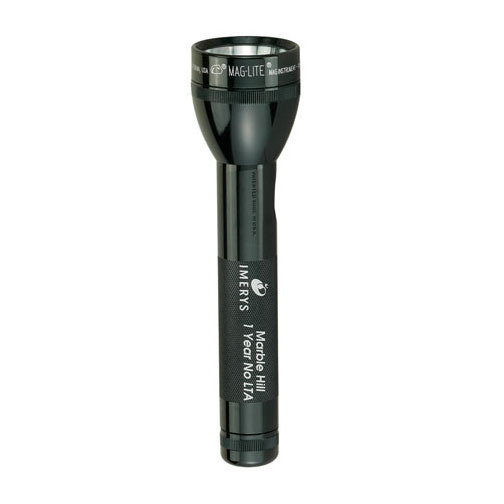 Maglites are impact resistant and vibration proof, which makes it a dependable flashlight in any situations. 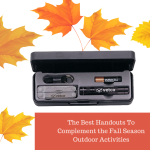 The long lasting batteries and the hassle free operation will make it a favorite choice among your recipients. 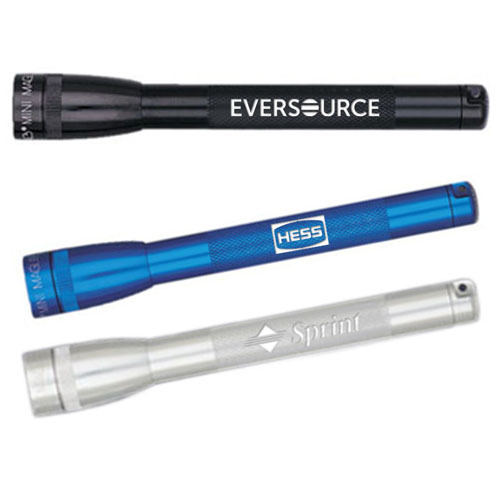 Imprint your brand and message on these high quality flashlights and see how your brand exposure goes up to a higher level. 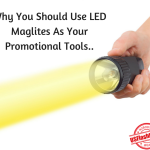 A trusted choice among the police and security forces, maglites has become a potent marketing tool in promotional circuits. Marketers looking for custom gifts that will ensure consistent impressions can place their bets on imprinted maglites. 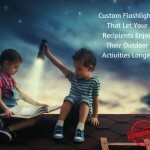 Highly reliable and sturdy, these personalized flashlights that are 100% made in USA have set a new paradigm in quality. 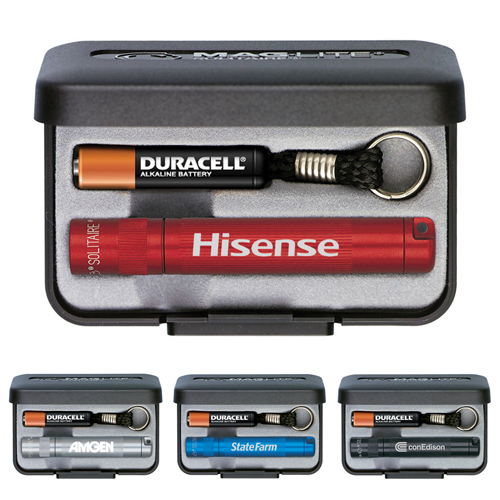 Flashlights are everywhere; people need it as safety kit items and daily use essentials alike. Maglites are no ordinary flashlights as these are designed to bear the brunt of the outdoors and the hostile weather conditions with a big grin, which makes it a perfect choice for outdoor adventure activities , fishing holidays and camping among others. Customize these with your brand and message to make it a perfect hand out for promoting events and brands. 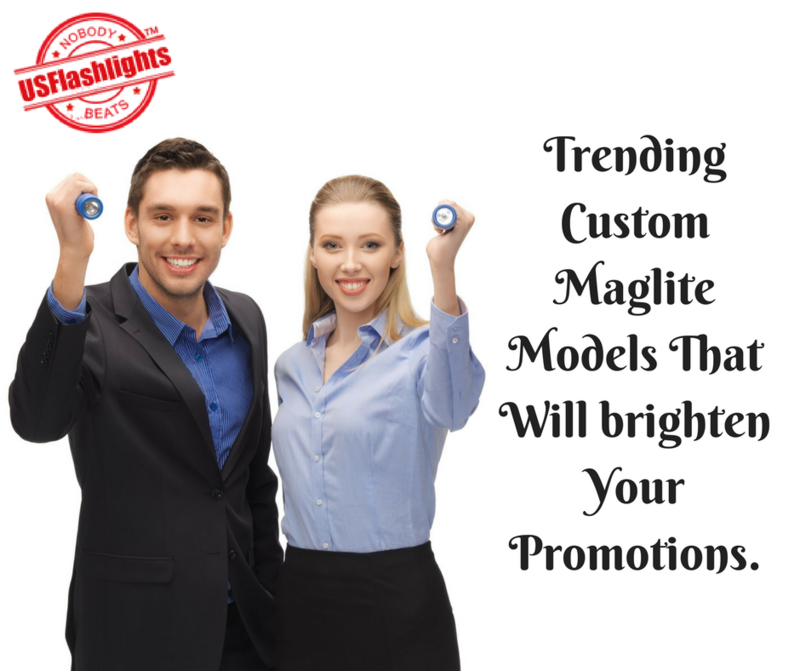 Look what is trending in custom maglites this season and make sure to include these in your promotional mix. Remember, bulk orders carry the best deals. 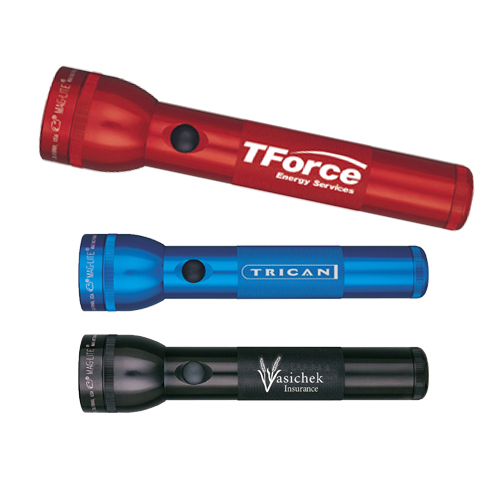 Custom 2D Flashlights: Driven with Mag-technology, these flashlights emit the bright light at minimum battery consumption. 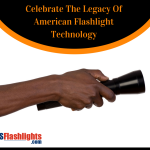 The Flashlight measures 10” and offered in a 4 color chipboard box, this flashlight will make a good investment choice in any season. 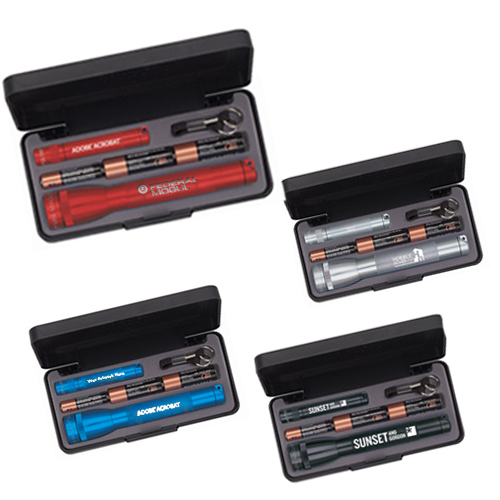 Custom MagLite Combo Set: This combo set offered in an attractive gift box includes 2 Maglite sources measuring 3 ¼ and 5 ¾ , 1 AAA and 2 AA batteries, with key ring/lanyard attached. These logo items will make consistent impressions for a long time without any repeat investment or effort. Ideal for budget marketing and fund raising events. Printed MagLite Mini: Great for home and office use, these brightly colored flashlights send out a powerful beam that can reach to 40 feet in distance. The anodized and corrosion proof design will make it last long and well suited for all types of weather conditions. 9 Inch Custom 2C MagLite Flashlights: These maglites generate high intensity beam, which can be adjusted from a sharp point to a flood. The shock and water resistant features will make these flashlights great for all types of conditions. 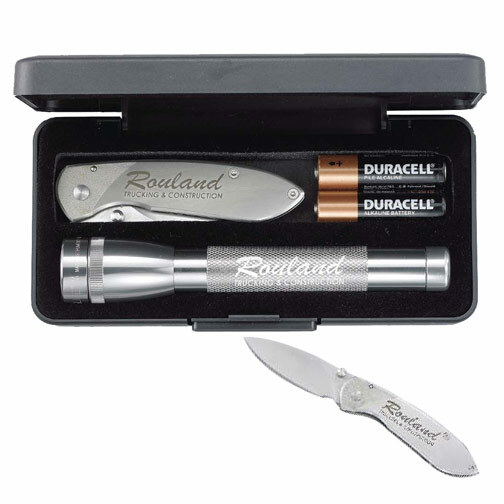 Mini MagLite with Buck Nobleman Knife: It makes a powerful gifting choice that will grab easy attention of everyone around. Maglite measures just 5 ¾ in length, and Buck “Nobleman” knife possess 2 5/8” blade and 3 ¾” titanium coated handle. 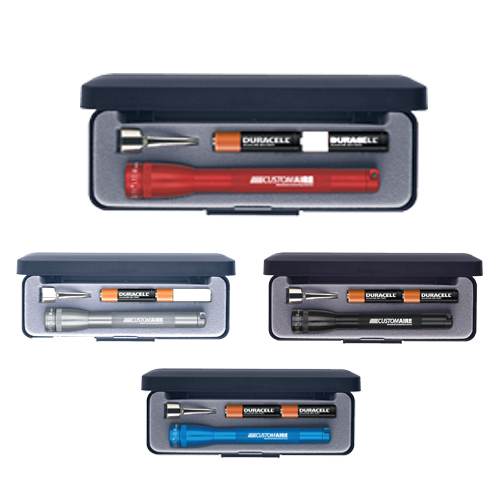 Customize these with your brand and message to make it a value added gift item that will keep your brand well exposed. 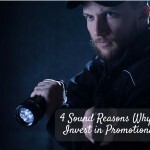 Which custom flashlights are you planning to make your promo gift this season? Do share with us at the comments section.